If you're looking for the most complete, technologically advanced power protection unit, the ULTRA 2000VA is exactly what you need. The ULTRA 2000VA is an absolute must for anyone running small servers, workstations and powerful PCs. 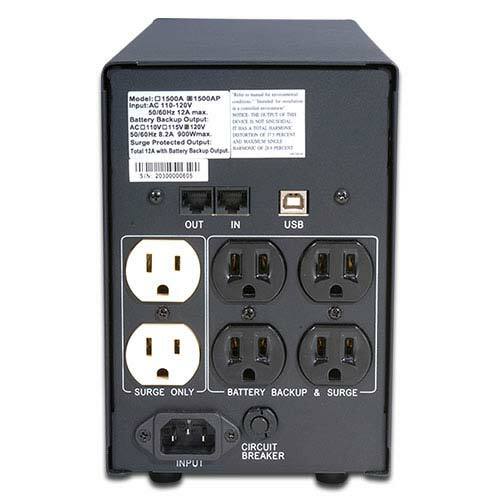 And ULTRA is so confident that the ULTRA 2000VA offers the best power protection in the world that they offer a $125,000 guarantee against damage to your connected equipment while the 2000 VA is in use! You simply cannot afford to cut corners when it comes to safeguarding your valuable equipment, and the ULTRA 2000VA delivers the most comprehensive protection for computer, peripherals and data files at a remarkably low price. The ULTRA 2000VA offers an incredible array of features and benefits including line interactive design, AVR (auto voltage regulations), USB communication port, alarms for battery backup, low battery and overload, energy saving function (UPS green mode), automatic charging when UPS is off and much more. This outstanding unit protects up to four devices simultaneously and is fully digitized microprocessor controlled. For the ultimate protection at a minimal cost - choose the ULTRA 2000VA power protection unit.